Strikers have voted to return to work at the Lindsey Oil Refinery in North Lincolnshire after a deal was struck over the foreign workers row. The deal, negotiated by the GMB union, opens 102 new jobs to British workers in addition to the posts awarded to an Italian company. No foreign workers will lose their jobs at Total's oil refinery, the firm said. Meanwhile staff at Nottinghamshire's Staythorpe power station are staging a protest in London over a lack of work. Around 400 workers at Longannet Power Station in Fife have also ended their unofficial strike action and returned to work. 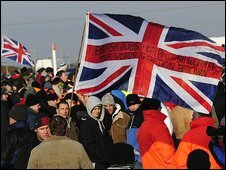 The unofficial strikers at Lindsey had argued they were being excluded from applying for jobs that went to the Italians. They will return to work on Monday, allowing them to rest over the weekend. GMB union official Phil Whitehurst said: "We have now got the chance to go back to work but the fight does not stop here. "The fight continues at Staythorpe and anywhere else where an injustice is being done. "It was a unanimous decision. It was an excellent vote. We have got the MPs worried. I think we have got Gordon Brown worried." Strike committee member Tony Ryan said: "It's been a hard week for the lads, this week they've stood out in all weathers. "It's been a hard-fought fight, and I'm glad the lads are back at work, earning money again, and the Italian lads are still here." A Total spokesman said the company was pleased with the outcome and looked forward to working with the contractors. Around 195 foreign workers will continue to work on the project which runs until 31 May this year. Following the deal, Business Minister Pat McFadden defended the principle of free movement to MPs at commons question time. He said there are three-times more Britons working in other European Union member states than foreign workers in the UK. He said: "The recent report from the European Commission showed there were 47,000 UK-posted workers in the rest of the EU, three-times more than the 15,000 posted workers from the rest of the EU working here in the UK." Mr McFadden added: "We have been told that all sub-contractors on the site at the Lindsey Oil Refinery are required to pay according to the industry-agreed rates. "Now Acas will test the veracity of that claim, but that's what we have been told. So whatever this week's dispute was about I don't think, on the face of it, it seems to have been about a race to the bottom in terms of pay." The dispute began last Wednesday, sparking copycat protests from thousands of workers at power stations and other construction sites around the country. Workers from Staythorpe power station are staging a protest in London over claims they have been refused work. They are campaigning outside the headquarters of the firm at the centre of the row, Alstom, to call for contracts to be opened up to them. The union Unite is "seriously concerned" that around 850 jobs needed to build a turbine, boiler and connecting pipe will not go to UK workers. Who is behind 'wildcat' strikes?